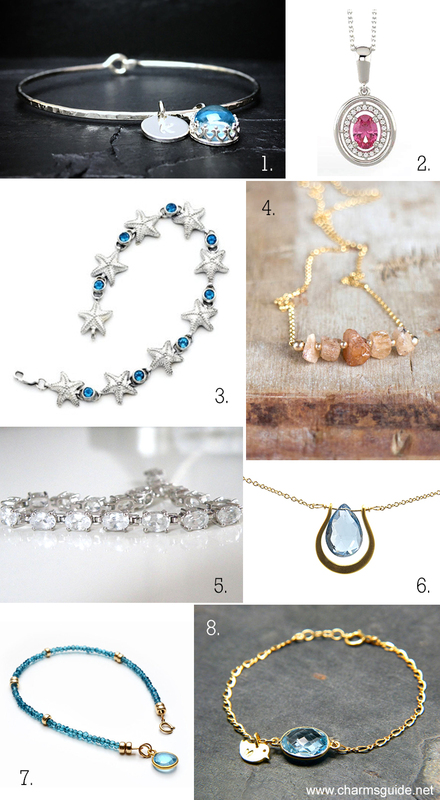 History, facts, healing properties and our curated selection of the November birthstone topaz. The idea of birthstones is thought have ancient roots. Experts trace it back to around 1300 B.C. and the breastplate of Aaron – a religious garment set with twelve gemstones that represented the twelve tribes of Israel. Later writings (1st and 5th century AD) associated the stones in the breastplate with the zodiac signs, suggesting that each stone had special powers, and would work as a talisman when it was worn at the right time. The tradition of associating specific gemstones with particular months is rumored to have begun in Poland in the 1700s, and the list as we know it today here in the US was adopted as a standard by the National Association of Jewelers in 1912. While most agree on which stone(s) go with which month, there are some variations. For November, the standardized birthstones in the modern tradition are citrine and topaz, although some say that blue topaz is an alternative birthstone for December. We are sticking to the guidelines of the American Gem Society and the Gemological Institute of America, and associate all colors of topaz with November. Pure Topaz is clear as glass, but thanks to a variety of impurities, it also comes in many colors, including red, pink, brown, yellow, orange, purple, green and blue. The least common and most sought after is the “imperial” or “precious” topaz. It comes in many hues of yellow, orange, pink, and red, and is also the 23rd anniversary gemstone. The blue varities are the most common and least expensive, and while blue topaz does sometimes occur naturally, the blue color is most often achieved with the help of irradiation (radiation) and heat treatment. The resulting colors range from a pale baby blue (known as Sky Blue) to the crisp Swiss blue to a nice, rich deep, almost teal, blue (called London or Super Blue). Blue Topaz is also the anniversary gemstone for the 4th year of marriage. Stones with these names are actually not topaz at all, but quartz. Topaz quartz is citrine, the other November birthstone. There are so many healing properties attributed to topaz! Topaz in general is a soothing stone that is thought to improve health and well-being, strengthen nerves, relieve stress, calm tempers, eliminate nightmares and cure madness. It is also believed to help with vision problems, colds, blood disorders, digestive issues, and to stimulate metabolism. Blue Topaz is said to balance one’s emotions, bring mental clarity, truth, wisdom, abundance, joy and love, and help the third eye’s ability to see at a higher level. Yellow topaz is thought to help recharge the body and strenghten faith, optimism and confidence. It is also believed to help with tissue regeneration and improve blood circulation. 1. Bangle charm bracelet with a sky blue topaz mounted in a crown bezel by Nicoletti. 2. Stunning white gold pendant with diamonds and a pink topaz by Gianni Deloro. 3. Adorable sterling silver starfish bracelet with blue topaz stones by Gianni Deloro. 4. This gorgeous necklace comes in gold or sterling silver with 5 raw peach hued topaz gemstones. Handmade raw topaz necklace by Aylin of Abiza Jewelry. 5. Vintage sterling silver tennis bracelet set with faceted white topaz from 925 Sterling Lane. 6. Beautiful gold necklace with a sparkling faceted London blue topaz briolette. Blue topaz necklace by Aloha Jewels by Rosee. 7. Gold filled bracelet with faceted blue topaz rondelles and a Swiss blue topaz charm. Swiss topaz charm bracelet by Ruby June Jewelry. 8. Gold filled chain bracelet with a Swiss blue topaz and sparrow charm that can be personalized with an initial. Topaz charm bracelet by Wearable Things.